When it comes to makeup, one thing I can't live without is concealer. The MAC Pro Longwear Concealer is my holy grail product. Everyone seems to rave about the LA Girl Pro Concealer being a dupe for the MAC Pro Longwear Concealer so i decided to see what all the hype was about. First off lets start with the MAC Pro Longwear Concealer. It comes in a small glass bottle with a pump. The packaging is ok but could do with some improving 1. because the bottle is glass, I dropped and smashed my last one (luckily it was nearly empty) 2. the pump has issues! You try to squeeze out a tiny amount but end up with alot more than you need. Apart from the packaging this is one of the best concealers I have used. It is quite a runny liquid but provides full coverage. I have extremely dark under eye circles and need full coverage. Most concealers don't do the job but this one works perfectly. I also buy a lighter shade than my foundation so I can highlight with this too. Overall it gives full coverage without being heavy, doesn't crease, lasts all day and the bottle lasts me around 2-3 months. The LA Girl Pro Concealer is now available in the UK on the Beauty Bay Website. I ordered a few shades and found even the lightest shade comes up quite a dark pink. The packaging is a squeezy tube with a brush applicator. The consistency of this concealer is quite thick but again provides full coverage. If you are going for that no makeup makeup look then this ins't for you as I said the consistency is pretty thick. So the question is, is the LA Girl Pro Concealer a Dupe for the MAC Pro Longwear Concealer? No. In my opinion it isn't. You can't call something a dupe just because they are both full coverage. 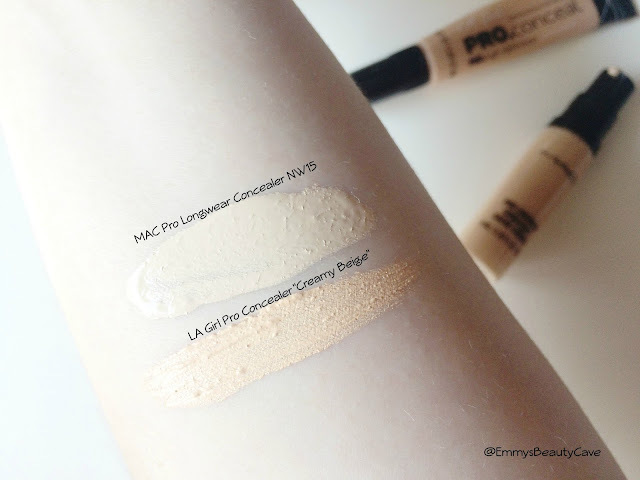 The Pro Longwear Concealer is quite runny and even though full coverage appears on the skin more lightweight. The LA Girl Concealer is pretty thick as you can really see the difference from my swatches. It is definitely an alternative if you are wanting full coverage but it isn't the same as the MAC concealer. The shade range in the LA Girl Concealer isn't good for really pale skin tones whereas MAC has a very large shade range. 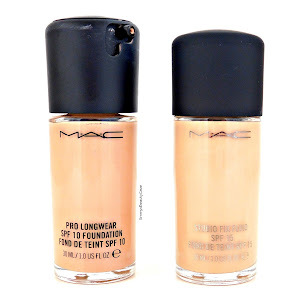 In my opinion both concealers are good but for me I do prefer the MAC Pro Longwear Concealer as it isn't as heavy and has a more flawless finish. Im an NW20 in MAC so quite pale and i ordered the lightest shade they had (lighter than the one above) and its a good match. 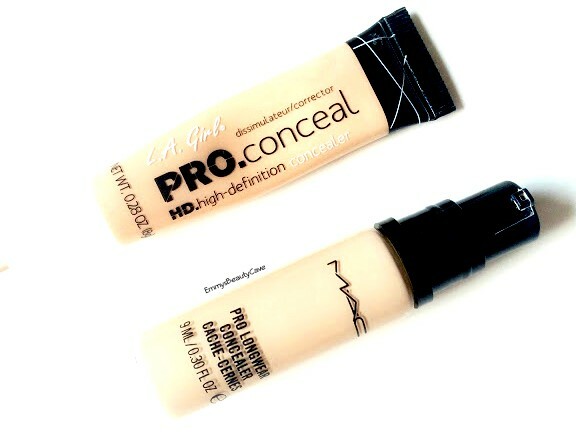 Ive just bought the La Girl concealer and I love it but it will never be as good as the Mac Pro Longwear!! Grea post girl!! I really want to try both of these concealers but i'm not sure if the LA girl one goes pale enough for me! I've been meaning to try the LA Girl concealer but I'm wondering about the shade range now! Good thing it's quite cheap! The LA Girl concealer sounds super high coverage, although the shade range doesn't sound great! I love the LA girl concealers, I have them in the Bronze goddess shade and the orange corrector, wasn't sure on trying the fair tone as felt they looked too pink online, glad I know now thanks!! 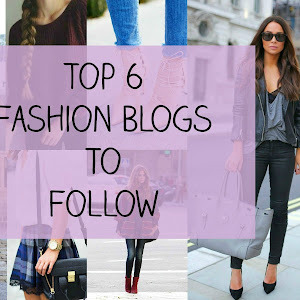 Seems worth a try, great post! Everyone adores that MAC concealer I think I'll have to try it, can't ignore it for much longer! I am on my 3rd one of the MAC Concealer & it lasts ages! 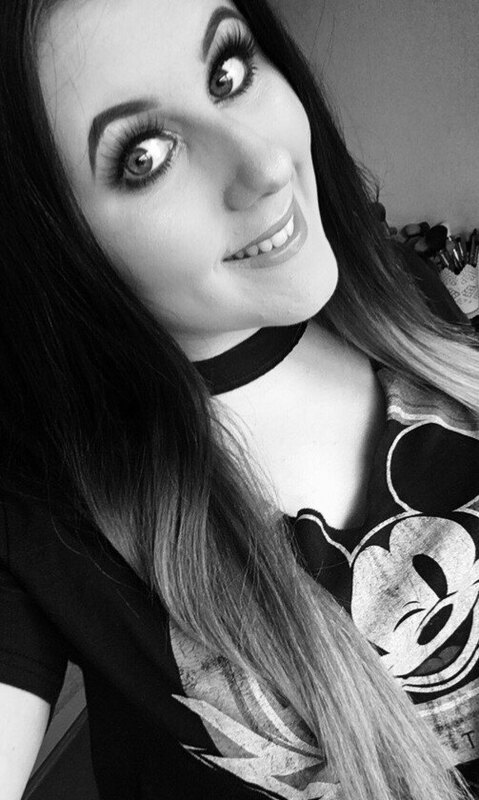 I recently picked up the LA Girl concealer from Beauty Base in the UK (The shop that sells perfumes) and really love it! I also got the orange concealer from them too which is great at counter-acting the dark circles under my eyes!